OK then. A very good week for all stock markets and the break out from the lower trading range (dashed blue line) was confirmed with a gap up (note chart below). But . 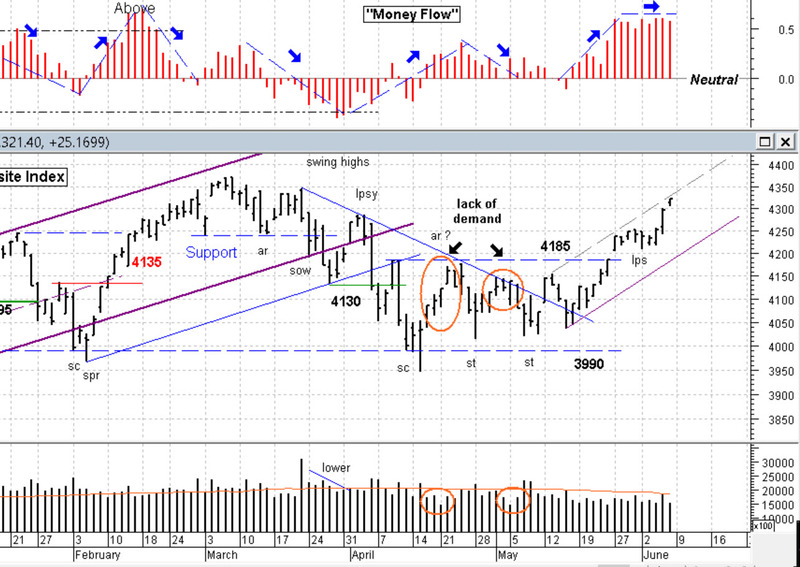 . . also note that the NASDAQ is approaching that previous high peak just off to its left at the 4350 level. What happens as it gets to that level will tell us if this market has “legs” or not. If we see heavy volume and weak bars (either wide range with closes near the bottom or very narrow bars), then we may be witnessing distribution and a version of a double top formation. Light to average volume, especially on strong up bars, would be a positive as there is minimal supply coming into the market. In the mean time, I would not be surprised to see a mild correction next week. Note that we’re up toward the upper range of that gray dashed line on the chart (the lower purple is a reverse trend line). Coming down to around the 4280 level on light volume would be OK, and set us up for a run toward the 4350 mark. So far I’m pretty happy about the average to below average volume this week. Stock is not coming into this market and prices (thus) have to go higher to meet the demand. So far, so good. Next week let’s not panic when we see a mild correction, but be very observant as to the strength of that move. Bar range / spread and its corresponding volume will inform us whether we should be concerned, or simply look at it as a buying opportunity (if not already in). The big test comes later at 4350 (or so). chart courtesy of MetaStock; table by http://www.HighGrowthStock.com. Used with permission.